Larger diameter wheels. Upgrading wheels and tires. Resizing wheels and tires. Modernizing wheels and tires. Campy clones, etc. the BFG's 255/60R15 & 205/60R15 is my planned choice. I grew up around a yellow and orange Pantera. 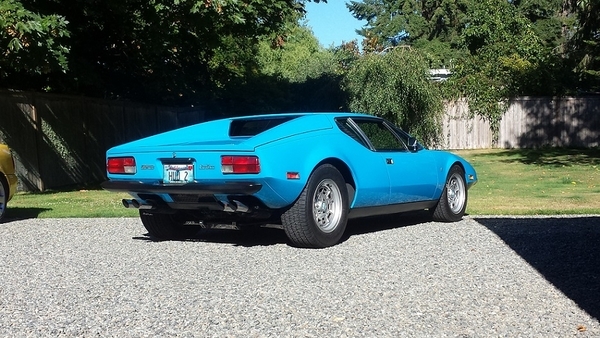 When I first saw the blue Pantera I wasn't too keen on it. Since then I've come to really like and appreciate this classic and rare color on the Pantera. Marti report shows it's 1 of 78 in Blue out of 1258 produced in 1973. Lots of pictures on Provamo too. I'll email you some hi-res in the sun pictures. Mine was blue. A previous owner painted it the best color. keep it low, 18's all around. I finally have to upgrade the old 15" wheels on my Pantera (hard to get rubber - plus one of the wheels is leaking). I'm most interested in Chip Fooses's new Pantera wheel design, with the gold center to highlight my car's green paint. Foose has now changed the tire recommendation for their 18x8"/19x11" wheels. They now recommend 225/40-18 and 285/35-19 for "a better fitment". Does anyone know the specifics as to why they changed their recommendations? My guess (and that is all it is) is due to tight tolerances and fitment/rubbing issues. Although I did not go with the Foose wheel I did go with the size he ran on his car - 18x9 & 19x11 wheels wrapped in 245/35/18 & 325/30/19 tires. I fought getting the correct offset on the front wheels due to rubbing at full scrub and eventually fabricated a new windshield wiper motor cover under the passenger front wheel due to tolerance issues. I initially thought I may have to roll the front fender farther forward (towards the nose) but ended up not having to after getting the correct offset. The factory roll on the front fender sufficed. With the rear wheels I had to roll the fenders a bit to get the tires not to rub. From an online tire size calculator it appears that the difference in Foose's tire size (on his red show car) on the front tires is 9.6" versus 8.9"(his new recommendation). Likewise, the rear tires went from 12.8" wide to 11.2". By the way, I ended up buying a tool that allowed me measure the offset needed for the actual tire I was planning on running. 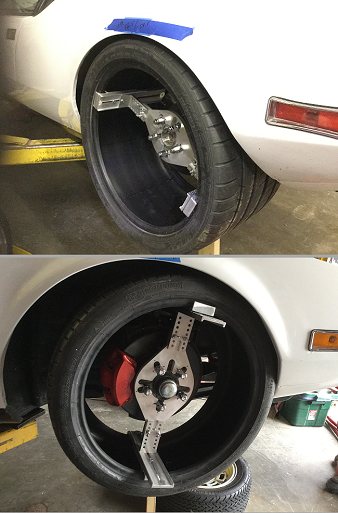 I mounted the tire on the tool, adjusted the offset, mounted the tool and tire to the car hub, and ran the suspension and/or steering through its paces...adjusting the offset until I found that sweet spot. Then there was no guess work involved. Just my two cents....or maybe the other tires are easier to get??? Devin have you ever posted a picture of your new tire/wheel combo? I don't remember seeing one. Of course I don't remember much of anything any more. I remember you writing you had chosen 12mm for the rear offset, I think you were going to use 16mm in the front, is that right? I did not post any pics. I'll try and get a picture when I make it to my shop. I think my car is getting lonely as I have hardly done any work on her in the last year. It's crazy how life's other obligations seem to push our "passions" to the back of the line. I will also look up what offset I ended up going with... my memory is failing as my kids quickly approach their teenage years. Thanks for the bump on the pictures...that is something I should have done some time ago. Where did you get the wheel offset tool? Cost? BTW, the front wheel size selected by Chip Foose was only 18x8, with what I think is an odd +19mm offset. The rears are 19x11 with a +6mm offset. The information I researched last year showed that Foose was running 18x9 in the front. He also mentioned that his buddy worked at Foose Design that gave him the information in the thread. I hope this helps. I will dig up the information and price on the offset tool later this evening. I recall it was rather pricey. 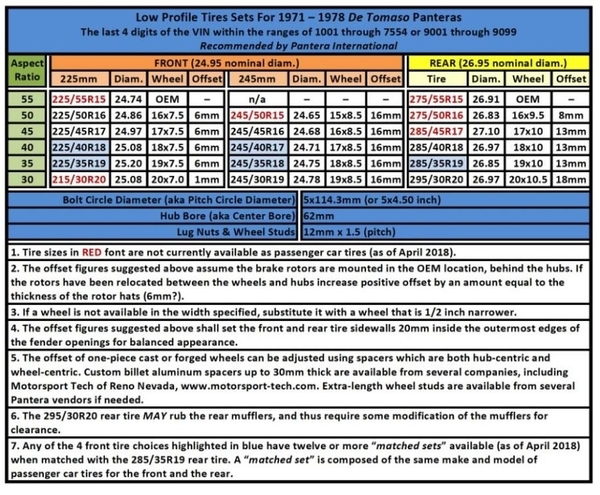 Here are the specs for the Forgeline Motorsport wheels that were built for my car. I did not have a chance to run to my shop today but I found these pictures on my phone this evening. The photos with the tires mounted don't have the center caps mounted - sorry. Thanks for your wheel specs. I bought the backspace/offset tool from www.thewheelfit.com. The model I purchased is the Wheel Fit Pro 45 and it retails for $399.00. If memory serves me correct I found some discount code or mentioned some advertisement and received a promotional price of somewhere around $360 when I ordered it. If you need any further information please let me know. P.S. I just did the backspace conversion math on the Foose Design offset for his rear wheel at 6mm and came up with a backspacing of 6.24 inches. I also did the math on his front wheels (based on the 18x8 wheel) and came up with the same offset of 19mm. What does this mean – I have no idea but I just thought I would see if their math matched my math calculations. Thanks for posting the pictures Devin, the car looks good! From the angles & lighting the tires appear to be recessed within the fenders about the same. But by my calculations the rear tires should be flush and the front tires should be recessed about 3/4". Which is it, recessed the same or the fronts recessed more than the rears? Thanks! That's a great tool. Takes all of the guessing out of it. Now the only problem is to exchange the tires until you get the right ones. As I posted previously, my old 15" Gotti wheels have finally given up the ghost, so I'm researching new replacements. My question is about front wheel offsets. I like the way my old wheels, with their 225/50-15 tires, fit in the front wheel wells. And they've never rubbed in all the years I've had them on the car. I measured my current 15x8" fronts wheels, and they have a 4.5" backspacing, which calculates to a 0 offset. All of the 17" and 18" front wheel offsets that I have seen (for the same 8" widths) vary from 12mm (5.0" backspacing) to as much as 22mm (5.375" backspacing). Why do the new wheels need so much more positive offset (added back spacing) compared to my old wheels? I know my old tires are short at only 24", but the 17-18" replacements are only 0.5" to 1.0" taller. And if I stick to 225/235 replacements, they are at most only 0.5" wider. One detail that may become a pain late in your Pantera adventure is, adding extra caster to the front wheels to cure tram-lining and instability at high speeds will pull the wheels & tires back toward the cabin. If you buy max-sized wheels & tires, fit them almost as a slip-fit to the fender openings and then try tweeking the handling as a final stage, you may find the right tire again hits the wiper motor cover, the left tire touches a cowl drainage tube and generally, there may be little rub-areas all around the front wheel area, when at full lock one way or the other. The left & right tires will NOT necessarily be perfectly aligned the same with the two fender openings either, as the multiple frame jigs the factory used were apparently not exact copies nor perfect mirror images. 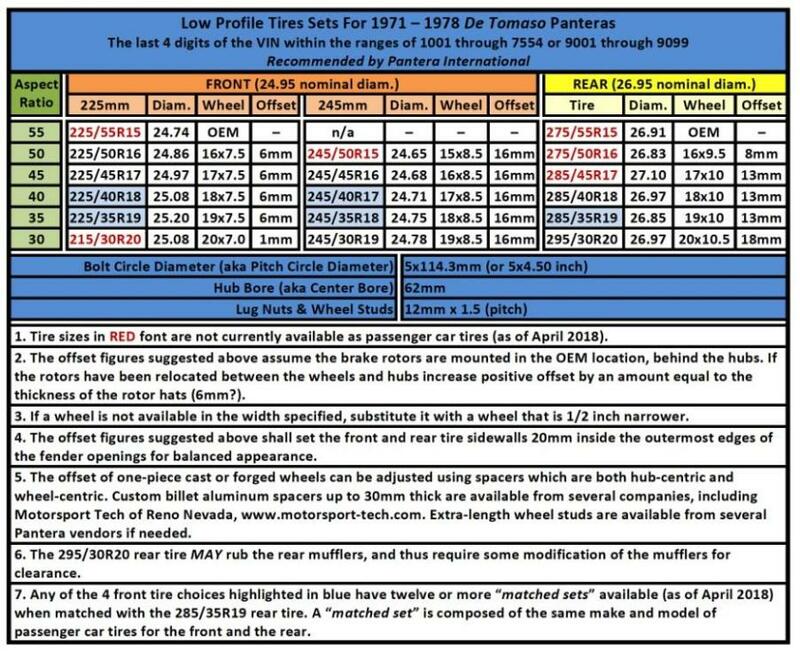 And of course, front frame movement from 45 yrs of use, crash damage (even minor), lowering to taste and other things can change clearances when 5X-or more- tires are fitted. Tires also vary in exact dimensions from different mfgrs or even between tire models from the same maker. To a lesser degree, the same goes when fitting giant rear tires. Best to leave extra clearance in excess of what George mentioned, or do all your handling & appearance updates before buying those max-size wheels & tires. Trading wheels & tires or flaring a fender for enough tire clearance on a 'finished' Pantera WILL be expensive! Sorry for the delayed response - I have been off the grid at the Teton Science School outside of Jackson Hole, Wyoming with my son's class as a chaperone. As per your question, both the front and rear tires on my new wheels are slightly tucked in from the outermost fender lip area (visually about the same amount on front and rear). I did this on purpose because I like that look more than the tire and wheel being exactly even with the fender lip (just my preference). Just as Bosswrench mentioned, my car was not exactly even on the front end. The front passenger hub sits slightly farther out towards the fender compared to the driver's side hub. It is not noticeable visually but I figured it out when I started measuring for the new wheels. Good question Craig. 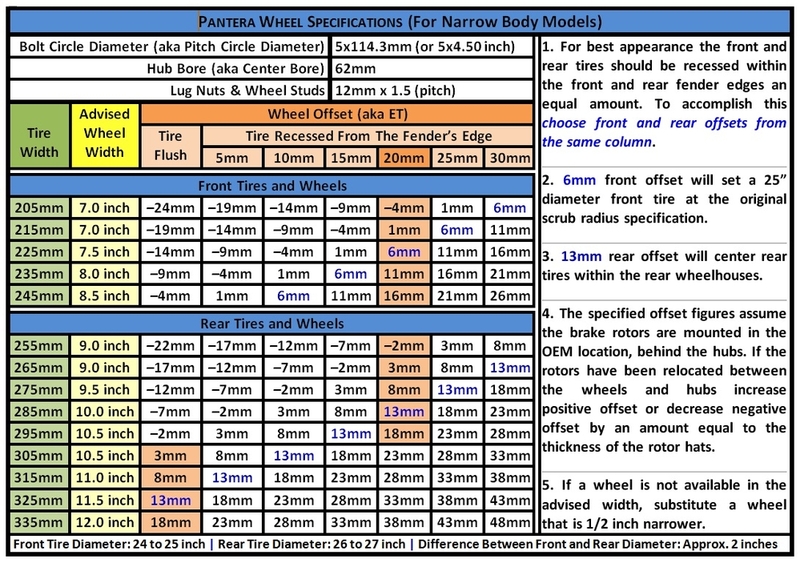 As a generalization most aftermarket Pantera wheels are built with too much front offset and too little rear offset. The front wheels are 8 to 9 inches wide and have 22mm to 25mm offset. A 245mm tire rubs the inner wheel house, and looks excessively recessed. By contrast the rear tires are generally offset to be flush with the fender edge; in fact the 335/35R17 tires stick-out from the fender by 5mm! Then the level ride of the chassis is upset because the rear tires are generally much smaller than OEM, so the rear end must be jacked-up or the front end lowered. You end up with a front tire that fills the fender arch as intended, but a rear tire that has a big gap between it and the fender arch. So the appearance of the tires is imbalanced front to rear in two ways, the amount they are recessed by offset, and by the gap between the tires and the fender arches. On top of that, the front tires are not centered within the fender arches, they are shoved forward. Correcting these things has been a crusade of mine. Yes small diameter tires and the vehicle's ride height both impact tire clearance. I recommend 6mm offset for 225mm front tires, and 16mm offset for 245mm front tires. I have a wheel width and offset guide I'll attach below. Devin thanks again. You've been a great help. Very cool that you are helping the school with the kids. I agree with you regarding the appearance of a "small" amount of tire recess. Emphasis on the word small (20mm?). Its also a very practical choice. I'm also excited that you were seeking the same recess front and rear, something I've been harping about for a long time. Finally I'm happy to see somebody "buck" the trend and use something less that 22mm to 25mm front offset. #6018 has been my guinea pig, and it seems there is some variation between our Panteras. The 325mm rear tires previously installed on 6018, mounted on wheels with 12mm offset, were flush with the top of the fender lip, not recessed. I wonder if that might be due to the tires themselves, as I used Michelins PS2's, and they were very wide. Whatever the explanation, it is a lesson for everyone to keep in mind. Finally I'd like to comment about the Pantera's front caster. If you take a look at any Pantera in which Ford reduced caster to about 3 degrees, you'll notice immediately that the front tires are not centered in the fender opening, they are pushed forward. This resulted when Ford moved the upper front ball joints forward about 1/2 inch in order to cut caster in half. If an owner moves the upper front ball joints rearward 1/2 inch in order to increase caster, restoring it in the range of 5 to 6 degrees, it centers the tires in the fender openings AND looks much better. There shall be no increases in rubbing in as much as the tires are positioned (centered) in the wheel wells as they had been originally intended. If there's any tire rubbing it will be on the inner wheel house, and only with the widest 245mm tires, because the vendors insist upon 22mm to 25mm offset. And even then its only during full lock parking lot maneuvers, nothing dramatic. Besides appearance the increase in caster improves forward stability, and what is less understood is that cornering "bite" improves as well, because the front tires "lean" into corners more. Ford reduced caster to reduce "bite" and increase understeer. Ford "dumbed down" the Pantera chassis in this way because they believed their customers could not cope with the full capabilities of the chassis (i.e. the immediate response to driver input). In terms of chassis response to driver input I personally want more! That's why I am a sports car enthusiast. Therefore from my perspective Ford's decision made no sense at all back then ... nor to this day. I don't want to revise the Pantera chassis to make it something better than it was intended to be, but whatever capabilities it was intended to have, I want them all ... undiluted by corporate Ford's committee made decisions. Craig here's the wheel width and offset guide. I have read all of this sticky and looked at several tire manufacturers but can't find replacements for the combo I have. My car has stock looking 2 slot wheels with 225/50/ZR16 tires on the front and 315/35/ZR17 on the rear. The existing tires are BFG G-Force TA KD. I haven't been able to find anywhere to get the same type/brand tires for front and rear. Anyone know what options I have. What I am running fit and clear fine. I think the only thing you'll find in a matched set are Pirelli P-Zero System but you'll have to go slightly larger on the rear (335/35-17). If you NEVER drive your Pantera in the rain, you can get 225/45-16 or 245/45-16, paired with a 315/35-17, in a Toyo Proxes R888R. It's an autocross tire so it won't last very long but you'll have fun in the meantime. I hesitate to even mention a competition tire for the street but some people seem to be OK with it. The wheels you have are obviously not OEM. I suspect they are Pantera East or perhaps Wilkinson wheels. If a tire set is not available via Tire Rack or On-Line Tires then stack your 16 inch and 17 inch wheels in the garage and opt for a more modern tire set in sizes that will be available for a while. We can't help with a wide range of custom sizes, but as a club we do our best to guide owners towards modern sizes that will best replace the OEM tires. Maybe this little chart we've put together will help … maybe not. But we exist to help you one way or the other. Debbie and I guarantee nobody has put more effort into this subject than we have. I can get Michelin Pilot Sport A/S 3+ in 225/50ZR16 and Pilot Sport PS2 in 335/35ZR17. Would this mix of tire types work OK? Norm, IMO ... those tires won't work well together at all. If you're going to mix tires, front and rear, you should choose tires that at least have the same traction and rubber characteristics. Pay attention to the UTQG ratings. They are just a guide and not 100% accurate but at least they give you an idea what the tire is all about, as far as rubber compound is concerned. The Michelin Pilot Sport PS2 is a great tire with a UTQG rating of 220 AA A. You should try to find a front tire with the same UTQG, or as close as possible. The Michelin Pilot Sport A/S 3+ has a treadwear rating more than double that of the PS2 (500). A UTQG of 200 AA A or 240 AA A should be OK too. A 200 A A, 220 A A or 240 A A would also be OK. For the sake of aesthetics, try to find a front tire with a similar tread pattern. This is tough. I don't think I would want the pure race Toyo Proxies R888R suggested but I did find the Toyo Proxies R1R with sizes 225/45ZR16 and 275/40ZR17. What do you guys think. Are Toyo tires any good? I replaced a set on another car I bought that had a serious right pull, with Michelins and the pull went away. Alignment was OK and not changed. Norm, Toyo’s are great but a 275 width is pretty small for an 11” rim (which I assume you have). A better option would be Continental Extreme Sport (225/50-16 & 285/40-17). That being said, the Pirelli P-Zero System combo is still the best for you. I realize they’re expensive but so’s your Pantera. I must have missed them but I didn't find both 16 and 17 inch sizes in any of the P-zero types I looked at. Do you know which ones? Be careful using Tire Rack's size search function. It misses lots of combinations. 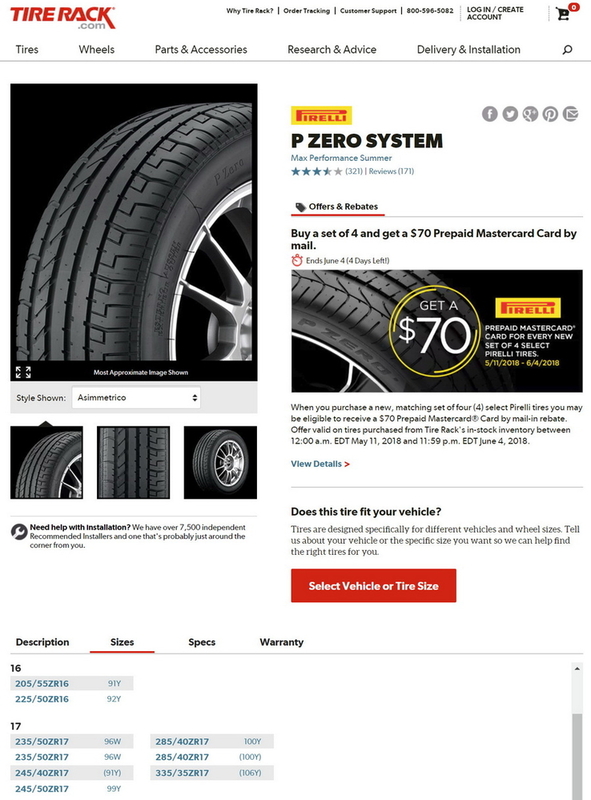 I looked on the Pirelli website and didn't find the P Zero system tires. I see their UTQG is 140 versus the Continental's 340. What are your thoughts on that? UTQG numbers are supplied by the manufacturer, so they're always taken with a "grain of salt". All you can really gather from the two tires you mentioned is that the P-Zeros have a softer rubber compound than the Continentals. They are both good tires but I believe the Pirelli's are better suited to your rim widths. I recall seeing the 335/35-17 P-Zero's for $488 each, I just can't remember where. Maybe the Tire Rack will let you have them for that. Get them before the sale ends (June 4th). What about Michelin Pilot Super Sports they have a tread pattern quite similar to the PS2's. I have used them in a 17 inch size but not sure if they come in 16's. Warning: several owners invested in 16" front wheels and tires, and then found that so-called 'big brakes' would not fit inside 16" wheels. If you think you need both giant tires and big brakes, choosing 16" wheels can be a VERY expensive mistake! An update on what I did. I have the 16x8 fronts and 17x11 rear wheels. My existing fronts were 225/50/ZR16 and rears were 315/35/ZR17. I could only get a finger between the rears and mufflers so couldn't go to 335 size. Couldn't find sets of 225 front and 315 for rear. I switched to 285/40/ZR17 for rears which are slightly bigger diameter but narrower. I could only find these sizes as sets in Continental and Pirelli P-Zero. I bought the Pirelli P-Zeros as listed in the Tire Rack P-Zero System. They are Asimmetrico. The fronts are listed as N3(Porsche) for 8" rims. Both UTGs are 140AA. I have installed the new tires (actually bought thru my local Tire Factory store). They are fine. The rears, although narrower tread width, look great, maybe better. Hope this update for these sizes helps someone. Thanks for all your help with info.